Acne is the most common skin disease. It is a condition that causes pimples on the surface of the skin. These are normally called "zits". Zits are a result of excess oil that gets trapped in the pores of the skin. The oil blocks the pores which leads to a build up of bacteria and eventually infection. Acne is most prevalent among pre-teens approaching puberty and teenagers. 80% of teenagers suffer from acne, making the disease the most common skin disease. It is the most consulted skin condition among dermatologists. Acne is not confined to teenagers alone. Many adults also suffer from the it. The most common location for acne is the face. Acne is not harmful. It does cause discomfort but it is not life threatening. What is of concern with acne is that it may cause some psychological effects on patients specially with teens. 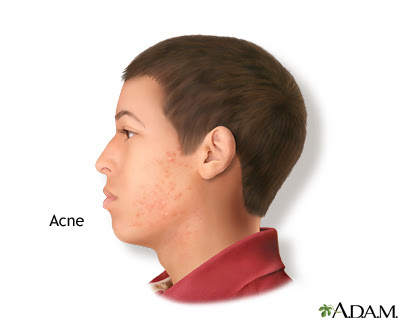 Acne affects the person's self confidence, self image, and how he or she interact with the people around. There are medical treatments of acne available. Some popular treatments are epiduo and doxycycline, which is an antibiotic.Epiduo Gel contains adapalene and benzoyl peroxide, a common treatment used for acne. Other remedies for acne is thyme which is becoming a popular "organic" alternative. Thyme contains thymol which is an antispetic. Scientists are also looking at nanotechnology and coconut oil which contains lauric acid as another alternative treatment to acne. Lauric acid has antiviral, antimicrobial, antiprotozoal and antifungal properties that can be used against the acne bacteria. Could viruses be used to treat acne? Scientists have isolated and studied the genomes of 11 viruses, known as phage, that can infect and kill the acne-causing bacterium Propionibacterium acnes, potentially paving the way for topical therapies that use viruses or viral products to treat this vexing skin condition. Their results are reported in the September 25 issue of mBio®, the online open-access journal of the American Society for Microbiology. "There are two fairly obvious potential directions that could exploit this kind of research," says Graham Hatfull of the University of Pittsburgh, an author of the study. "The first is the possibility of using the phages directly as a therapy for acne. The second is the opportunity to use phage-derived components for their activities." P. acnes is a normal resident on human skin, but its numbers increase substantially at puberty, eliciting an inflammatory response that can lead to acne. Although antibiotics can be effective in treating acne, antibiotic-resistant strains of P. acnes have emerged, highlighting the need for better therapies. Hatfull and his colleagues at the University of Pittsburgh along with scientists from the University of California, Los Angeles, isolated phages and P. acnes bacteria from human volunteers with and without acne, then sequenced the phages' genomes. What they found in those genomes was surprising. The phages were all remarkably similar, sharing more than 85% of their DNA, an unheard of level of similarity among viruses, which usually exhibit a great deal of diversity. This lack of genetic diversity suggests that resistance to phage-based antimicrobial therapy is less likely to develop, they say. All of the phages carry a gene that makes a protein called endolysin, an enzyme that is thought to break down bacterial cell walls and kill the bacteria. Enzymes like this are used in other applications, says Hatfull, suggesting that endolysin from these phages might also be useful as a topical anti-acne therapeutic. "This work has given us very useful information about the diversity of that set of enzymes and helps pave the way for thinking about potential applications," he says. From here, Hatfull says, research with these phages will explore how they might be used therapeutically, but phages like these can also provide useful tools, like genes and enzymes, that can be used to manipulate and understand the bacteria they infect. "The information derived from these phages helps contribute toward those kinds of genetic tools," says Hatfull.